School is in session! Many Alums will be starting grad school this month and many more members have recently ended their service, which means it’s a great time to start your “Back to School” reading list to get edumacated on all things service! The following books will help you continue your spirit to serve your local communities while you move onto the next big chapter in your life after AmeriCorps. For those of you who are part of the “AmeriCorps Book Club” or are sharing stories of service with your kids, these will be a great addition to your reading list! From POL: “Be The Change” explores individuals’ capacity to create change in world – whether they are a well-know businessperson, national leader or ordinary citizen. The book intertwines practical tips on service and volunteerism with real-life stories of personal transformation. Throughout the book, Michelle offers reflections to create a narrative of hope and encourages readers to begin their own journey of service and discovery. From Amazon: Giving 2.0 is the ultimate resource for anyone navigating the seemingly infinite ways one can give. The future of philanthropy is far more than just writing a check, and Giving 2.0 shows how individuals of every age and income level can harness the power of technology, collaboration, innovation, advocacy, and social entrepreneurship to take their giving to the next level and beyond. 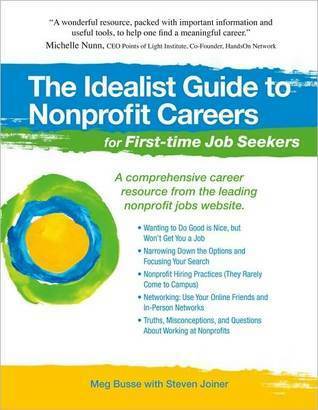 From Amazon: The Idealist Guide to Nonprofit Careers for First-time Job Seekers is a comprehensive resource for emerging professionals pursuing their first position in the nonprofit sector. Whether you are a current student, a recent graduate, or someone entering the workforce for the first time, this book will provide you with indispensable advice, relevant strategies, and nonprofit-specific resources to strengthen your job search. Written by nonprofit career experts, The Idealist Guide is designed to be easily accessible and convenient to read. What’s on your service reading list? Let us know in the comments below. Thanks for including us on this list! These are great recommendations. Also recommend Everyone Leads: Building Leadership from the Community Up by Paul Schmitz CEO of Public Allies. Has lots of good advice on how leaders and organizations can bring people together to solve problems.